Duche de Baviere. / Het Hertogdom Byeren. A stunning map of Bavaria, Germany first drawn by Daniel de la Feuille in 1706. Includes Munich and Augsburg. Surrounded by thirteen maps and views of important villages and fortresses in this region. 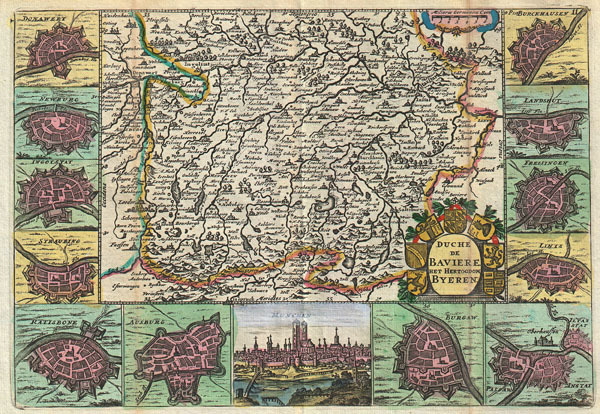 From top right in a clockwise fashion these include Burkhausen, Landshut, Freisingen, Lintz, Instat, Burgaw, Munchen (Munich), Ausburg (Augsburg), Ratisbone, Straubing, Ingolstat (Ingolstadt), Newburg and Donawert. Title cartouche in the lower right hand quadrant features seven armorial crests, each representing a Bavarian city. This is Paul de la Feuille's 1747 reissue of his father Daniel's 1706 map. Prepared for issue as plate no. 12 in J. Ratelband's 1747 Geographisch-Toneel.